Luis Elizondo, the former head of a Pentagon program to investigate U.F.O. sightings by the U.S. military, says we may not be alone. The former head of a secret government program to investigate UFO sightings told several media outlets that extraterrestrial life may exist. Simultaneously, the public benefit corporation he is affiliated with has raised more than $2.2 million to research "exotic technologies" affiliated with "unidentified aerial phenomena." "My personal belief is that there is very compelling evidence that we may not be alone," said Luis Elizondo, the person who formerly managed the Pentagon Advanced Aviation Threat Identification Program, in an interview with CNN. In a separate interview with National Public Radio (NPR), Elizondo added that his remarks don't necessarily mean the craft were extraterrestrial, as his focus was more on learning about any potential problems with national security. "If you're asking my personal opinion from here, look, I've got to be honest with you, I don't know where it's from. But we're pretty sure it's not here," Elizondo told NPR. "Now does that mean it's 'out there'? Whether or not it's Russian or Chinese inside, or little green men from Mars, or frankly, your neighbor's dog, I wanted to purposely steer away from that [speculation], because I wanted to focus on truly the raw science: What were we seeing, and did it pose a threat to national security?" Elizondo resigned from the Defense Department program on Oct. 4, writing in his resignation letter that there needs to be more attention paid to "the many accounts from the Navy and other services of unusual aerial systems interfering with military weapon platforms and displaying beyond-next-generation capabilities," according to The New York Times. Elizondo and two other former Defense Department officials — Christopher K. Mellon and Harold E. Puthoff — have created a venture called To the Stars Academy of Arts and Science, which aims to investigate "exotic science and technologies", according to its website. "We believe there is sufficient credible evidence of unidentified aerial phenomena that proves exotic technologies exist that could revolutionize the human experience," the organization's website states. The company has fundraised more than $2.2 million from nearly 2,500 individual investors. Elizondo's remarks come amid recent revelations that the U.S. government had a secret, $22 million program to seek out UFOs that ran between 2007 and 2012. 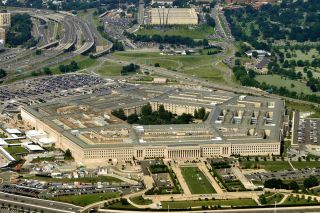 The Times reports the program is still ongoing, although the Defense Department said a lack of funding shut the effort down. Also, in recent days, Navy pilots reported that they spotted a UFO during a training mission off the coast of San Diego in 2004. "It accelerated like nothing I've ever seen," said Cmdr. David Fravor in an interview with the Times, adding that he was "pretty weirded out." To the Stars references these reports frequently on its website. To the Stars' mission is to examine science that was "suffocated by mainstream ideology and bureaucratic constraint," the venture's website says. It plans a fusion of science, aerospace and entertainment to "work collectively to allow gifted researchers the freedom to explore exotic science and technologies," according to the website. While the evidence for intelligent extraterrestrial life is still far from firmed up, the U.S. government has searched for UFOs across several other programs. Those include Project Sign (in the 1940s), Project Grudge (in the 1940s and 1950s) and the more famous Project Blue Book, which was dissolved in 1969. In 2016, the Central Intelligence Agency released many classified documents related to UFOs. Scientists also search for alien microbial life. NASA, for example, has an astrobiology program seeking to learn the ways in which extreme microbes could survive on icy moons such as Europa (a water-spouting moon near Jupiter) or Enceladus (which has dozens of water geysers and orbits Saturn). Searches for past life continue on Mars, with the upcoming Mars 2020 rover designed to directly cache samples where purported Martian microbes might have lived. Alien life has also resurged in popular culture lately. The "Star Trek" and "Star Wars" franchises each premiered several movies in theaters in the past few years. In 2017 alone, "Star Wars" fans got to see "The Last Jedi" while Trekkies got an entire new TV series called "Star Trek Discovery." Meanwhile, the 2016 movie "Arrival" explored what could happen after aliens arrive at Earth.